Originally published in England as four individual novels, The Brothers of Gwyneddtransports you to a world of chivalry, gallant heroes, and imprisoned damsels; to star-crossed lovers and glorious battle scenes; and is Edith Pargeter’s absorbing tale of tragedy, traitors, and triumph of the heart. I am pleased to be apart of this "Summer Reading Group" that been so thoughtfully put together by Sourcebooks. 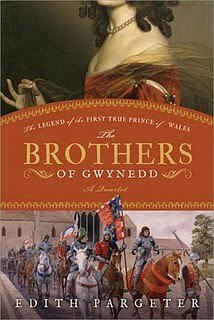 Our feature book for this group is, The Brothers of Gwynedd, A Quartet by Edith Pargeter. Since the book was originally published as four separate books, we will be reviewing one book a month throughout the summer! Book One, Sunrise in the West, focused on setting the stage for what looks to be a tale of turmoil, passion and treachery. Told from the perspective of Samson, a man with strong connections to the Gwynedd brothers, we learn who is who and the ambitions of those in power. At a very young age, it seems Samson is connected to Llewelyn, son of the great prince, in a vast amount of ways. These two friends are torn apart during their youths and sent their separate ways, only to find one another again by random twists of fate. Now as a grown man, Samson gives his loyalty to Llewelyn and follows him through every battle and hardship. I am very glad that The Brothers of Gwynedd is broken down into four separate books; it will definitely allow for an easier reading experience. The first 40 pages mostly focused on describing the relationships between everyone, which made for a slow and at times confusing beginning; the authors writing style probably did not help this. Once the story began to focus more on the brothers of Gwynedd, I found myself much more engaged with the story. With this first book only being 186 pages, it provided plenty of treachery and intricate plots. I think this book definitely set the stage for the next one, and I am looking forward to reading what happens next with these dramatic Welsh brothers. Here are the links to everyone else participating in the Summer Reading Group!